Non-Muslims students at a Michigan university have been offered a chance to try hijab for the first time when their Muslim counterparts marked the university's hijab day earlier this month. “It was pretty cool to meet people that wanted to try the hijab,” Amala Farah, freshman student at the Eastern Michigan University, told the Eastern Echo on Monday, December 9. 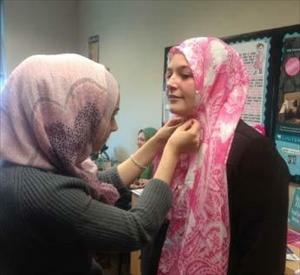 The Muslims Student Association (MSA) at the Eastern Michigan University has celebrated the hijab day in the Women’s Resource Center with dozens of attendants. During the event, held from 10 am to 3 pm last Wednesday, MSA students helped non-Muslims students to try hijab for the first time. The event included a lecture on hijab by the marriage and family therapist Nadia Bazzy who spoke about her personal experience as a veiled Muslim woman in the US. “To experience something new and to better understand something is to engage in it,” Bazzy said about the women who wore the hijab for the first time. During her speech, Bazzy tackled the principles of hijab in Islam and the challenges that face veiled women. Wearing hijab at the age of 16, Bazzy was criticized by her family as her father feared that she would be discriminated among her colleagues. Attending a catholic school, Bazzy was inspired by the catholic traditions which revere Virgin Mary. Virgin Mary's modesty mad her 'unique', that’s what has encouraged her to wear hijab, she said. “You don’t have to physically wear a scarf to be a hijabi,” Bazzy said. Receiving 70 free headscarves, attendants shared their experience after wearing hijab for the first time. "I was enlightened by the experience, and I liked doing it,” freshman Emily Chadwick said. “I liked to experience something from another culture, she added. “There is a big Muslim population here,” sophomore Mariah Brito, said. “It wasn’t weird for people to see me wearing the hijb," added Brito who had a fascination with the hijab. US Muslims are estimated to be between six to seven millions and a recent Pew research found that American Muslims are the most moderate around the world.